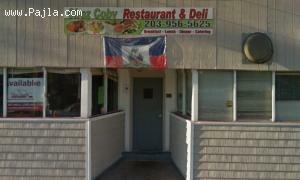 Haitian Cuisine Get $10 off your first app order! Download the Grubhub app to get $10 off your first app order and unlock the magically convenient world of food delivery. Griot. Served with while rice, rice and beans, mushrooms, plantains and salad. Tassot cabrit. Served with while rice, rice and beans, mushrooms, plantains and salad. Tassot dinde. Served with while rice, rice and beans, mushrooms, plantains and salad. Poulet frit. Served with while rice, rice and beans, mushrooms, plantains and salad. Lambi. Served with while rice, rice and beans, mushrooms, plantains and salad. Served with while rice, rice and beans, mushrooms, plantains and salad. Oxtail. Served with white rice, rice and beans, mushrooms, plantains and salad. Poulet dur. Served with white rice, rice and beans, mushrooms, plantains and salad. Cabrit en sauce. Served with white rice, rice and beans, mushrooms, plantains and salad. Legumes. Served with white rice, rice and beans, mushrooms, plantains and salad. Served with white rice, rice and beans, mushrooms, plantains and salad. Poisson gros sel. Served with white rice, rice and beans, mushrooms, plantains and salad.